* Stop #4 of my Burger Love adventure. The journey continued with "The Picnic" from Pizza Delight in Summerside. Not an overly large burger, just a 6 oz patty, but the flavour combination and variety of ingredients put this one in towards the lead. 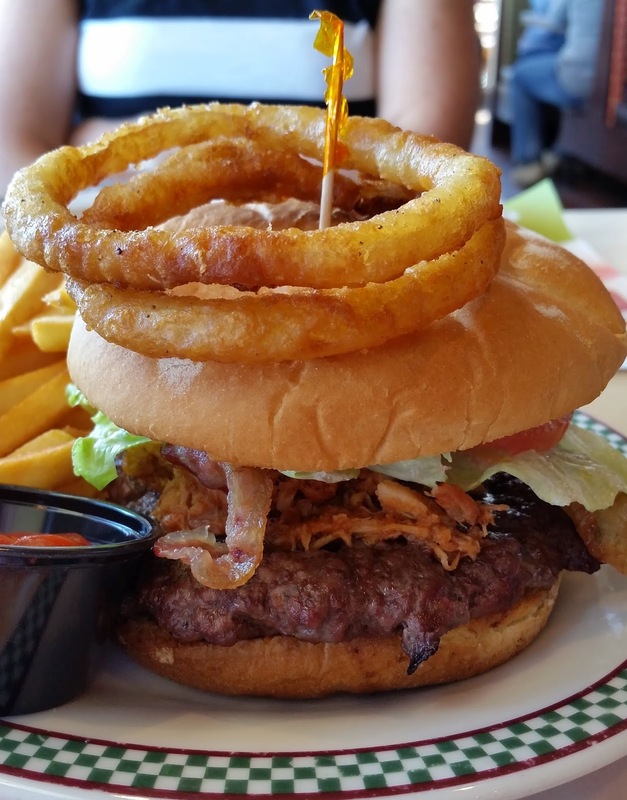 The burger was topped with shredded chicken breast soaked in BBQ sauce along with bacon, lettuce, tomato, donair sauce on a garlic bun and the only onions on this one were cooked just the way I like them, deep fried. For me what put this one over the top was the addition of the chicken on the burger, it wasn't a lot but the combination of the burger, bacon and chicken made the burger very tasty. On the negative side the burger itself appeared to be a frozen pre-made patty, had it been "fuller" and made in-house this one could have potentially been in the top spot. Overall a really good burger and was definitely surprised that a contender on my list came from a pizza joint.